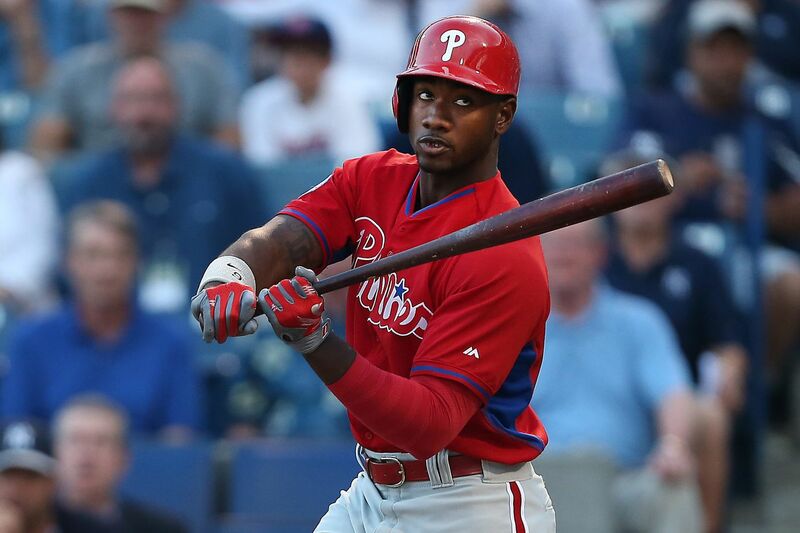 Quiz: One-time Phillies all-stars … and where have you gone, Domonic Brown? Remember when Dom Brown was an All-Star in 2013? Check out what he's up to today. Mike Schmidt holds the Phillies record with 12 all-star selections. Robin Roberts and Steve Carlton are tied for the most among pitchers with seven. But what about those flashes in the pan that pose for the All-Star Game picture one year and are gone from our consciousness shortly after? Guys like Joe Hoerner (1970). Tuesday likely will be the first of several all-star appearances by young Phillies ace Aaron Nola. But in honor of those one-time all-stars — looking at you, Randy Wolf (2003) — here's a little quiz. 1. Which Phillies centerfielder made the final out in the 2007 All-Star Game? Answer: Aaron Rowand made the final out of the 2007 All-Star Game in San Francisco with the bases loaded and the NL trailing, 5-4. Rowand flied to right field on an 0-1 fastball from L.A. Angels closer Francisco Rodriguez. "Less than a quarter-inch and we've got a different story," Rowand said. "I just missed it. I got it on the sweet spot. I just got a hair underneath it." Aaron Rowand made arguably the greatest catch in Citizens Bank Park history in 2006 and was selected for his only All-Star appearance for the club the following season. He broke his nose and several bones in his face making the play off a drive by the Mets’ Xavier Nady. 2. Which one-time Phillies all-star made his only appearance as the NL starter at third base in 2002? Answer: Scott Rolen made his only All-Star Game appearance for the Phillies in 2002 as the NL's starter at third base. He was traded to the Cardinals a few weeks later at the deadline and made four All-Star Games while with St. Louis. 3. Who followed up his only all-star season by going 2-9 with a 6.51 ERA in 2000? Answer: Paul Byrd was 11-5 with a 3.94 ERA when he was made an all-star in 1999. He did not pitch in the game and was 6-16 with a 6.19 ERA in his Phillies career afterward before he was traded in 2001. 4. Where is Domonic Brown (2013 all-star) these days? Answer: Domonic Brown is playing for Tecolotes de los Dos Laredos of the unaffiliated Mexican League. He's hitting .293 with three homers in 12 games since being assigned to Dos Laredos on July 3. Brown was struck out by Toronto's Brett Cecil in his only plate appearance. That also was the only All-Star Game appearance for Cecil, who is currently in the Cardinals' bullpen. Answer: Ricky Bottalico was not the winner, but he did pitch a scoreless fifth inning to help the NL shut out the AL 6-0 at Veterans Stadium. Brady Anderson reached on an error, but Bottalico got Cal Ripken to fly out and Jay Buhner to line out and struck out Pudge Rodriguez. Ripken, baseball's all-time leader in consecutive games played, suited up for the All-Star Game despite suffering a broken nose during, of all things, the team picture the day before. The bench holding the players shifted, and he was struck in the nose by falling White Sox pitcher Roberto Hernandez. "When Ripken came up, the first thing that came to my mind was `Don't hit him,' " said Bottalico, who threw two straight outside pitches. "I didn't want to be the goat who knocked him out of his season." Answer: Catcher Ozzie Virgil and rightfielder Glenn Wilson made their only All-Star appearance for the Phillies in 1985. It was the only season between 1979-87 that Mike Schmidt was not an All-Star. Schmidt was switched to first base that season (so Rick Schu could play third, ugh) and was hitting just .242 at the All-Star break. Wilson struck out against Willie Hernandez in his only at-bat, but Virgil had a two-run single off Bert Blyleven and caught Nolan Ryan for three innings as the NL won, 6-1. "[When] Ozzie Virgil Jr. first came to Phillie spring trainings with a pocketful of minor league homers and a face full of laughter, the Luzinskis, Bowas and Boones treated him like a batboy," Daily News columnist Mark Whicker wrote. "Not until 1982, when Virgil was 25, did he make the Phillies … Not until 1984, when Bo Diaz was hurt and Virgil was just summoning up the moxie to ask Bill Giles for a trade, did he play regularly." 7. How many All-Star Games was Von Hayes selected to play in his nine seasons with the Phillies? Answer: If you flubbed this question, you've obviously not been paying attention. The Phillies traded five players (Jay Baller, Julio Franco, Manny Trillo, George Vukovich and Jerry Willard) to Cleveland to get Hayes in 1982, and his 1989 appearance was his only All-Star Game. Franco, the best of the five, did not make it to an ASG with the Indians, by the way. He did appear three times with Texas, however. 8. Wayne Twitchell made his only All-Star Game appearance for the Phillies in 1973 before the team started to become a perennial contender. He attended the same high school in Portland as a seven-time all-star. Name that guy. Answer: Wayne Twitchell was 25-40 in his big-league career if you take out the first half of 1973 when he was 8-3. He attended Woodrow Wilson High School, which later produced seven-time all-star Dale Murphy and 1995-96 NBA rookie of the year Damon Stoudamire. Twitchell gave up a double to John Mayberry, the father of the former Phillie, and struck out Reggie Jackson in his All-Star appearance. Answer: Odubel Herrera was the Phillies representative in 2016, and Pat Neshek was the guy last season. In 2015, it was Jonathan Papelbon. 10. Three Phillies have been the winning pitchers in the All-Star Game. All three did so in their only appearance with the club. Which of the three is it? Answer: A. Ken Raffensberger pitched scoreless innings in the fourth and fifth to win in 1944. Doug Jones was the beneficiary when the NL rallied with two runs in the ninth and won it when Moises Alou drove in Tony Gwynn to win in 1994. Heathcliff Slocumb won the 1995 game by striking out Pudge Rodriguez and Jim Edmonds to end an American League rally. Slocumb, who pitched with a mustache (but not a gnarly beard like Jones did), once explained, "I was always a hairy kid. I've had the mustache since I was, uh, 12."